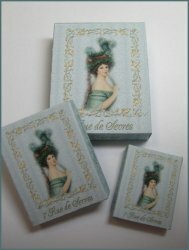 A wonderful collection of kits to create boxes and shopping bags for your ladies shoppe. Our boxes are the finext available. 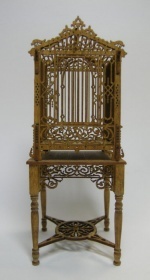 All designs are my original work, incorporating unique and beautiful antique and vintage artwork from my extensive collection. Images are printed in the highest quality on 110 lb cardstock. The artwork is then sealed, and uv protected. And then each piece is laser cut and scored, for a perfect fitting piece every time. All you need to do is punch, fold and glue. 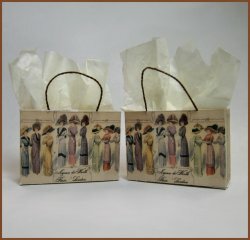 Our shopping bags kits also are made from original artwork incorporating images from my collection of antique fasion magazines, in particular, La Mode, from around 1910. These images are so beautiful, and age has added a beautiful warmth to them that is not found in new images. The artwork is printed on high quality acid free paper, and again sealed, and uv protected. The bags must be hand cut and scored, as the paper will not allow for us to do this by laser, however the projects are easy to complete. Kits even include the cording for handles, and tissue paper to fill your bags.